For several weeks now, Hubby and I have both been sick with a very virulent flu, forcing us to spend many weeks in bed or quietly in our recliners, with little activity, other than a brief trip to Washington DC to work with a client. After weeks of illness, we finally emerged from our cocoon with enough energy to consider finding another dog, so today we went looking. We always like to have at least two dogs at a time so they can keep each other company when we are on the road, so for the last few weeks, I've been checking onto local shelters and other sources for a dog. We didn't want a puppy, but we did want a fairly young dog, one that could come out with us on the trail when we go riding. That meant we didn't want a herding dog, as they tend to nip at the horses heels even when we want them to stop moving, which tends to create some havoc. We didn't necessarily want another lab, and though there are a lot of them at the shelters, pit bulls were out because of so many places that won't allow them (fairly or not.) I discovered many of the shelters list their dogs on craigslist as well as their own website, which actually made it easier because it was all in one place. Ultimately, though, we found a listing for a dog that was simply a single mom who had just moved to the area and whose new job required too many long hours for her to properly take care of her, especially considering she had been rescued from a home that had neglected her, and needed lots of extra loving. Thus, we arranged to meet Lola. 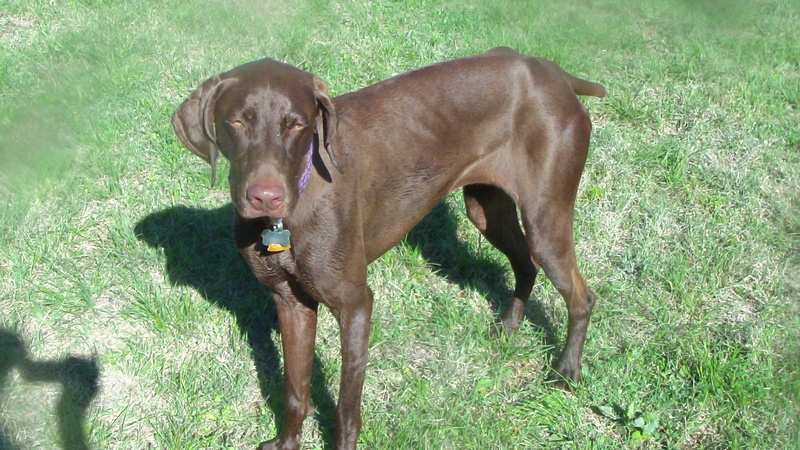 Half Weimaraner, half German Short-haired pointer, she has the tall build of a Weimaraner, but is solidly the color of chocolate (or more accurately from a breeder's standpoint, liver). She is super active, ran around the dog park fetching balls like a mad dog, with legs so long it seemed like she is all legs. Seriously underweight, her hip bones and her ribs were sticking out, and I think she won our sympathy vote more than anything else. She seems to have a good temperament, and our family had Weimaraners when I was young, so I felt quite at home with her. After an hour of getting to know each other, we packed her in the van and brought her home. She was so anxious she wouldn't settle down, and was hyper all day. She is a fetching fool, running after tennis balls for more than 5 hours straight!! We had some company over to the house in celebration of my niece's 16th birthday, and she literally wore all of us out! That was fine, though, because we were hoping to tire her out enough to get her to sleep through the night. She had many bouts of diarrhea throughout the day, so obviously her digestion is screwed up, and no doubt it will take some time to get some pounds back on her, but TLC is our specialty when it comes to animals! Anyway, she behaves as though she's very intelligent, just too stressed and hyper to get through to her right now, but once she settles down and learns she's part of the family, things are sure to work out! She is gorgeous!